We are gathered around the table–five women whose lives have been upended in some measure by the closure of the university. Four are faculty wives; three of us are stay-at-home moms. One lady is a faculty member. The reports vary: jobs are in hand for two families; three job contacts in one day for another (we say YAY! ); and a couple more are acting and waiting…a job in itself. We are here to share life and to talk to God about it around this table. We’ve been doing so for the past several months. As we pray, it occurs to me that, even though those verses were originally given to a group of people who had been exiled from their home land, they were not words for only then–or for only now. God never changes, and He desires our hearts toward Him and our trust in Him to be always steadfast–regardless of the circumstances. Truth digs in and hangs on. What truth is anchoring you today? My friend Janice was the catalyst to my involvement as a political activist. She urged me to “run” for a precinct committeeman position, and that was my initiation into the way grassroots politics work. I have to admit that I’ve spent a freezing cold first Tuesday of November morning or two with my school-age children (civics education! ), standing outside a polling place, telling voters that the candidate I supported would appreciate their vote when they pulled the lever/pushed the button. (Not legal to do that anymore–I hope it was then.) I have made phone calls and knocked on doors in GOTV (Get Out the Vote) efforts. Sometime my candidate won, sometimes he lost. I don’t list these things here to brag or boast. But I was trying to analyze if they have a common thread. I think they do. It is…belief. I believe life is sacred and that, from the moment of conception, that which it is politically correct to call a “fetus” is a living human being–a baby. I believe in government of the people, by the people, for the people. I believe the men and women who have volunteered to put their lives on the line to purchase and maintain my freedom should have the support and undying gratitude of all their fellow citizens and their government.I believe in the republican form of government that has been established in the Constitution of the United States of America and that it does not come without cost, without eternal vigilence and a focus on what is true and right. So…I act. I speak. I affirm. I persuade. Question to myself: Am I as ardent an activist for the Cause Which Matters Most? I believe in God, and in His Son Jesus as the only Savior and Hope for sinful mankind. I believe in grace offered to all who believe that Jesus died to take the punishment that all of us who are sinners–that’s everyone, Folks, if we take the Bible’s word on it–deserve, and that it can be mine if I accept it as a gift I can’t repay from a God whose love for me knows no bounds. That is everyday belief for me. So–what is my everyday activism that goes along with it? I know this–a sign or a picket or a rally won’t cut it. This belief is bound up in relationship with the Creator God of the universe and His Son, the Savior of the world. So my activism must follow suit–it must be bound up in relationship with those with whom I interact, those to whom I speak, with words affirming and persuasive. What does it look like to be an activist for that belief? It was Thanksgiving 1996. Things were the same but not the same. Michael’s family had spent many Thanksgivings together in the years since I came into the mix by marriage in 1982. But, the siblings had always before gathered at the folks’. This time, one of Michael’s sisters was the hostess. We were festive together…but not quite. You see, Tony was dying. My brother-in-law (husband of Michael’s other sister) had been diagonosed earlier that fall with a malignant brain tumor. Surgery and treatment had slowed things down a bit, but they had left Tony changed in many ways and had left the entire family with a verdict that ended with a death sentence. As it was, Tony had highs and lows over the first half of the next year and he died late that summer. God will make a way, when there seems to be no way. He works in ways we cannot see; He will make a way for me. He will be my guide, hold me closely to His side. What do you think about rewards for children at church? We give trophies and points and gift certificates and prizes for all kinds of activities done under the church roof–bringing friends to activities, memorizing Bible verses, bringing Bibles along with us to Sunday school, even for just being there (I grew up in an era when, at the end of my childhood days, I had a long string of pins and add-ons that I’d been given for “perfect attendance” at Sunday school). There is something motivating about the prize–the ribbon, the medal, the trophy, the points. (We’ve just spent two weeks watching grown-ups from around the world who have given it all for the gold, the silver, and the bronze.) And that, presumably, is why we offer rewards or incentives to those to Sunday school kids. I’m not against it, even though we live in an age when competition is a dirty word in some arenas. Actually, I don’t really see the kind of thing I’m asking about here as competition; competition is what we do, in a friendly way, among the Bible quiz teams that I’m involved with as a coach. This thing I’m talking about is definitely more in the realm of motivation and incentive. So, that’s enough to go on–this is probably not a totally foreign subject to anyone reading this, so you know of what I speak. But, in the church, what should be the guiding principle(s) when it comes to “awards”? If you can give a bottom line–or a pseudo bottom line, that which we should NOT be striving for–I’d like to hear it. The grandbaby is walking. She successfully took three or four unassisted steps in my direction on Wednesday; later in the day, she treated Uncle Gabe to the same demonstration of her new skill. 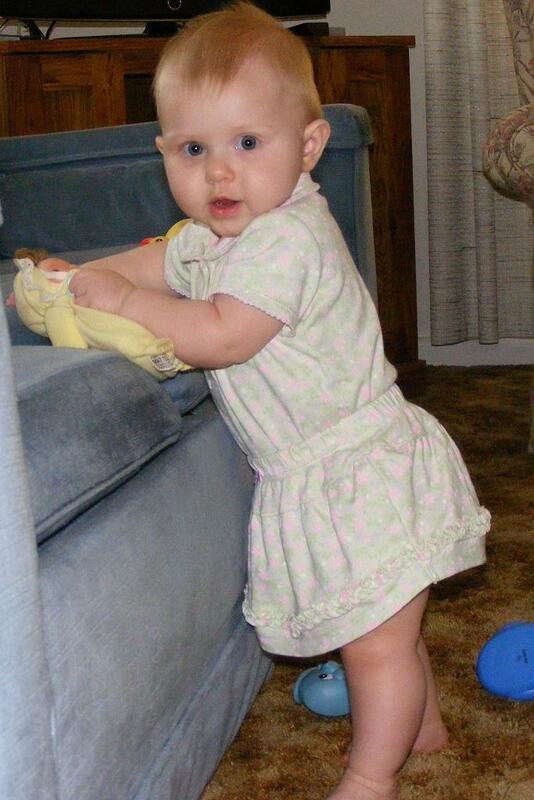 In case you haven’t spent much time around a baby lately, let me refresh your memory of the process and significance of those steps: For months, all of her “peeps” have encouraged any activity that appeared to be remotely related to the eventual walking skill. Since she was only several months old, she has indicated the desire to be pulled up on her feet from a sitting or even lying position–and, of course, we have all thought that was Wonder Baby stuff and have cooperated with meeting that “need”. Her mama has said over and over, “We want to encourage her to ‘cruise’ around the furniture at your house as much as possible, because we don’t have so many good places for her to do that at our house.” In more recent days, any family gathering has included two adults spacing themselves a short distance apart, facing one another. The baby is stood on her feet in front of one adult, facing the other, who gleefully holds out his or her arms, in hopes that this will encourage Baby to take those much-awaited first steps. And now, it has happened. Imagine the following: Now that Melanie has taken those first steps, we totally stop encouraging her walking in any other way. We get irritated when she chooses to crawl instead of walk, even though for her it is more familiar and faster at this point in her development. As the weather gets cooler, no shoes or boots are provided for those little feet which will more and more often carry her into life’s adventures (Last winter, she was carried everywhere.). Maybe you can see where I’m going with this. I was pondering the parallels in spiritual life. Don’t we who call ourselves Christ-followers sometimes do the same thing with those who are just beginning to walk with Jesus? We invest lots of time and encouragement before they begin to walk–we call it being “seeker friendly” or “doing evangelism”. Then they take those first steps and we are all excited. We may even keep track of the dates and of the numbers who start walking. Then, far too often, we do the spiritual equivalent of the above paragraph–we stop encouraging, we get impatient or irritated or critical when our “baby” reverts sometimes to pre-walking activities, we fail to provide the tools for that new walker to make it successfully and safely through the challenges faced by all who walk. I’m going to keep on observing and pondering this process–I’m pretty sure I’m going to see a lot more than a cute little sweetheart delighting her family with her latest trick! Evaluate. Reflect. Meditate. At the risk of sounding like a question in the game of Tri-Bond, what do these three activities have in common? They require time for a thoughtful look at something. Last night marked the end of a six week small group training series in which I’ve been participating. Each of us 40+ participants in these sessions has been stretched and challenged to see through new eyes the places and the people among whom we’re planted in life. God created us for relationships and in the course of those relationships, we may have the opportunity to help people connect with the Greatest Relationship they will ever discover–knowing God through becoming a follower of His Son Jesus. We’ve spent the last six weeks talking about and learning how to get better at all of that. At the end of our gathering last evening, our leader had each of us take two sticky notes. At the top of one we wrote “I’m leaving…” and, on the other, “I’m taking…” was written. We were to complete those statements with words to express what we were leaving behind as a result of the past six weeks and what we were taking with us as we move forward from this experience. I am very grateful to our leader, Pastor Bill, for building in those few moments of evaluation and reflection. It came immediately to me what I was leaving and taking from the experience, but had I not been forced to stop and think about it, it may have taken me days or even weeks to realize it, to articulate it. Somebody has said “The unexamined life is not worth living.” (Philosopher Son-in-law, who was that?) I wonder if I would be more tuned in to the value of everyday if I would stop and reflect and evaluate more intentionally and regularly? And I like the idea of sorting out what I’m leaving behind from an experience (sometimes “leaving behind” is letting go; I suppose it could also have to do with “contribution” or “legacy”) and what I’m taking away–those two actions add up to change, and change means growth, and growing is a good thing. What will you leave behind from this day’s experiences? What will you take with you? An expatriate is one who is not living in his homeland. According to the dictionary, fine shades of this word’s meaning allow for that status to be by choice or by forced exile. We are foreigners in that we are strangers in this place in which we live. We don’t usually act like it. We act like we are rooted and grounded and almost part of the soil–we even talk about it that way, about our “roots”. But really, this is not our true home, the home we were made for. We were made for Eden. That’s the place where the first humans walked and talked with their Maker in perfect, intimate harmony. In the fresh, new, nothing-yet-spoiled world, that was their daily agenda. Then came the day when all of that changed. That perfectly harmonious, in-sync relationship became totally opposite. By choosing to make up their own game rules rather than following the “owner’s manual”, Adam and Eve lost their chance at Eden. They were literally forced from that place of perfection, into a world that would never be quite the same–weeds, pain, frustrated desires. That became the replacement daily agenda. At one of those funerals I attended last week, I heard the pastor say, quoting from the Bible, “…our citizenship is in heaven.” I wrote down in my funeral notes the word “expatriate”. We have never lived in our true home, the place God created us to live in–we call it heaven. It is so because it is God’s home and He made us to be with Him. But sin–choosing to do life the opposite of God’s way, choosing to disregard the “owner’s manual” we have in God’s Word–separated the first man from his home. It still separates people from their true home with God. So here we are, expatriates of sorts, waiting the return to our true home. Jesus, the Son of the Creator, said he was the Way. I’m glad my friends who died had found that Way.